The Klondike Derby always proves to be a fun event and this year was no different! In fact, this is an extremely popular Winter Scouting event across much of the nation’s northernmost Councils. 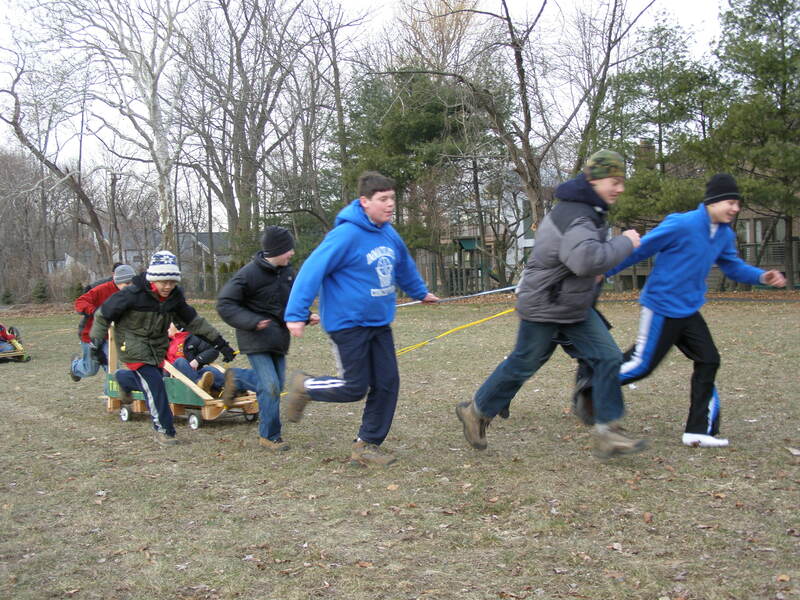 Compared to 2007, the 2008 Algonquin District Klondike Derby was a much-scaled down event, but still included 8 great stations that both challenged boys’ scouting skills and reinforced teamwork. Of course, there was the Klondike Derby race itself—the highlight event at the end of the day. And in that venue, Troop 353 clearly crushed the competition, aided by the fact that our Klondike sled had wheels attached! The 8 well-thought out stations, included Snowblind, Silent Signaling, Fishing for Snappers, Log Sawing, Log-pull, Balance Beam, Ice Rescue and the Siege Machine Catapult station (also know as trebuchet, mangonel or couillards)–all were designed with scouting skills and fun in mind. This year, with Siege Machines as the theme, scouts were encouraged to add a catapult-type device to their Klondike Sled to hurl an object (tennis ball) through the air, scores were given for both accuracy and distance. Thanks to a last minute major modification to our catapult, courtesy of ingenious ASM Mike D., this was another event in which Troop 353 excelled. Overall, Troop 353 had two patrol entries and came away with 2nd and 3rd place! With the 2008 Klondike Derby event being local, several dads braved the cold elements for the day and gave considerable moral support–some even manned a few of the skills stations. Lot of great photos can be seen here! Next time the American Red Cross’ Westchester chapter finds its emergency supplies in a hurry it can thank Dan Altenau. Altenau, a member of Boy Scout Troop 353 in Eastchester, had earned the merit badges and completed the leadership requirements for Eagle Scout, the highest rank in Boy Scouts. The only remaining condition was his final project. During one day each in December and in January, Altenau took inventory of and organized supplies at the ARC in White Plains with help from fellow scouts. He worked against the clock, too, since the undertaking had to be completed before his 18th birthday on Feb. 3. Once he’s 18, the Boy Scouts consider him an adult. There’s a lot more, and if you want to read the rest, visit the Review Press site.